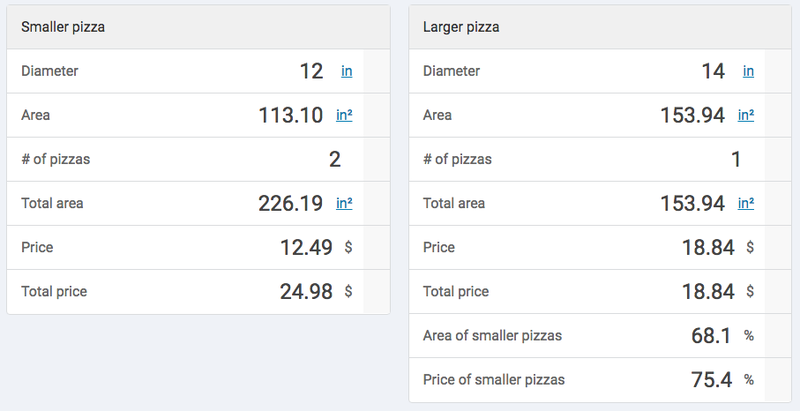 This Pizza Calculator Puts an End to the Debate: Two Mediums or One Large? And listen, I agree. Wholeheartedly. But as a Penny Hoarder, I always keep an eye trained on how to get the best deal. And math is not my strong suit — especially when I’m hungry. Add in a group of friends quarreling ever-more fervently over the topic of stuffed-crust Meat Lover’s versus hand-tossed Bacon Spinach Alfredo, and you’re looking at a serious problem. But in real life, the pizza-procuring process is rarely so parsimonious. Let’s return to that group of otherwise-pacifist friends of mine, huddled around a game of D&D (shut up), getting more heated about their respective pizza choices. The Bacon Spinach Alfredo and Meat Lover’s pizzas are both $12.49 for a 12-inch medium at my local Pizza Hut, in their default, hand-tossed crust. But since some of my friends out-and-out refuse to do without stuffed crust, we face a conundrum: You can only get that option on a large pizza. Say we compromise and do a large Meat Lover’s with stuffed crust (normally $17.49), and customize it to get as close to a perfect half-Bacon Spinach Alfredo, half-Meat Lover’s pizza as possible. Right off the bat, the bacon-spinach people are giving up a little bit more in the negotiations: Their choice normally comes with a special pretzel-salt crust, as well as a balsamic drizzle, which you can’t specify to a specific side on the customization screen. And I don’t think the meat folks are going to be down for balsamic glaze on their seasoned pork and pepperoni. Pizza Hut also won’t let you go halfsies on the sauce — probably a wise move, since the slices down the middle of a parmesan-tomato-sauce pie would be strange indeed. But it means that either the meat-loving folks will have to settle for a white pie, or the bacon-spinach people will have to give up their creamy garlic parmesan for red sauce. What a mess! Either way, after making all the customizations possible to get the closest approximation we can, the large, stuffed crust, Meat-Lover’s-bacon-spinach pie rings up at $18.84. Pizza Hut’s large, like most outlets’, is a 14-inch pie. So let’s crunch some numbers. 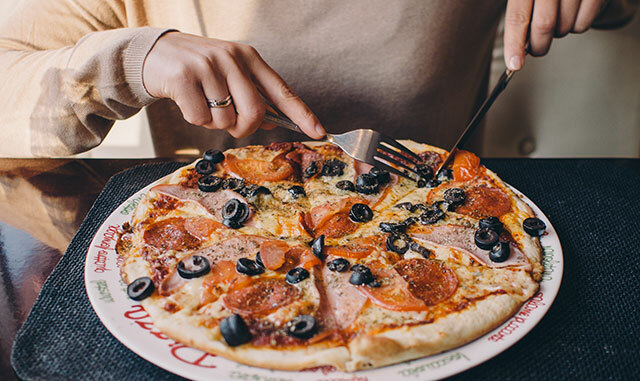 Using the calculator, we can see that we do actually get more pizza — and keep the party at optimum happiness levels — if we order two mediums. The large only offers 68.1% of the area of the two mediums, which means the smaller pies will feed everyone over 30% more pizza. (Note: This assumes an even split of spinach-bacon folks and all-the-meat folks. If one group’s an extreme minority, you’ll end up with a few really well-fed people and a bunch of people only getting a slice, or less, apiece). Before delivery, drinks, sides and tip, the large costs $18.84, as opposed to $24.98 for the two mediums. That means it’s about 75% of the price — for less than 70% of the pizza! 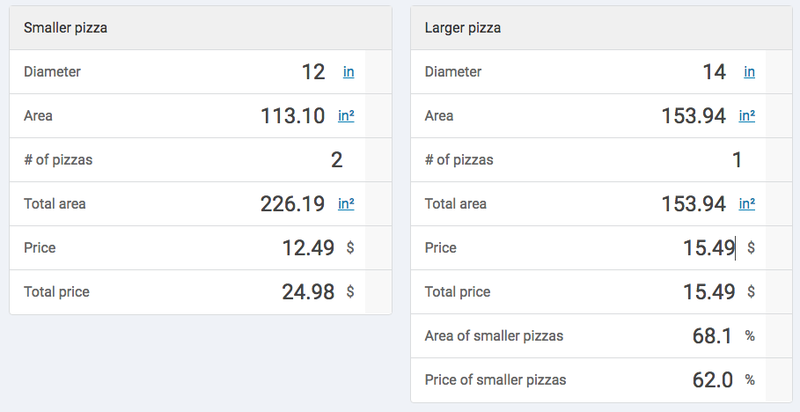 It’s not exactly cost effective… but it’s also probably not worth it to mangle two totally respectable pizza options to save such a small percentage of the cost. So the good news is, it looks like everyone at the party can put down their pitchforks. The bad news? I’m out an extra six bucks. Also worth noting: If we’d all been able to agree, it really would have made more sense to just buy the bigger version. Check out the comparison on two medium Meat Lover’s versus one large, both with hand-tossed crust. That’s right: We’d be getting 68% of the pizza for just 62% of the price. Yes, it’ll feed fewer people — but it costs less, inch for inch! And since we now know it’s the better deal, we could totally justify ordering two larges and enjoy the nothing-like-it pleasure of cold pizza for breakfast tomorrow morning. Looks like I’d better get those finicky spinach and stuffed crust people to cough it up. So, now that I’ve defused the situation at my nerdy party — what’s the takeaway for you? Bottom line: Our original advice still stands. The bigger the pizza, the better the deal, in almost every case. But if the group can’t agree on one set of toppings, you never know. It might just make more sense to swallow the upcharge and get two mediums. Either way, admit it — being able to tell the resident “stuffed crust only” aficionado exactly how much of a markup his pickiness costs? Your Turn: What pizza topping do you refuse to compromise on? Jamie Cattanach is a staff writer at The Penny Hoarder who won’t stay friends with people who don’t like pineapple on their pizza. Her writing has also been featured at The Write Life, Word Riot, Nashville Review and elsewhere. Find @JamieCattanach on Twitter to wave hello.